You may be surprised to hear that ComeOn have actually been in the industry since 2010. This means that they really can’t be classed as newcomers any more, with almost a decade of experience to their name. The company have made a big effort to make sure that football plays a huge role in the makeup of the site. Whilst the sport is definitely the biggest seller for European facing bookmakers anyway, it’s been good to see just how far they have been able to come over the years. Let’s hope that over the next ten years they show the same commitment and more importantly, keep improving on their current stock. It’s been quite tough to test ComeOn against their competitor in terms of pricing as they aren’t on any odds comparison sites. So, we’ve had to go back to the old-fashioned way and just test them against the stronger bookmakers in the industry. Whilst this isn’t as scientific as it could be, it should give a good overall guide to see how they perform. To be honest, there were very little surprises when it came to our findings. 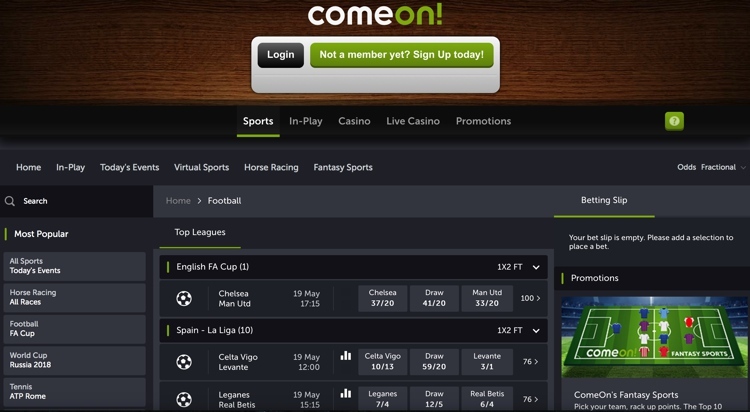 What you find with sites like ComeOn, who aren’t as big as the likes of BetVictor, Betfair or Ladbrokes, is that they pick their spots where they are going to be good, but for the most part is pretty average. Average isn’t a bad thing though and by this we mean more consistent. At no point did we ever find a price that we tested on Premier League games where they were the worst price. In fact, it couldn’t be further from the truth. We’d reckon that for about 90% of games they were right around industry standard. A further 5% they were up there with the best and the final 5% they were on their own or equal to best price. This is actually a really good return. It’s definitely comparable with some of the brands we just mentioned and an area that they’ve obviously been keen to improve and work with. This is based on previous times we’ve tested them to see they were below par quite often, albeit 3+ years ago now. Are there better priced bookies than ComeOn? Yes. But, that is absolutely no shame and we think they are going to be a tough cookie to beat. The reason that these ‘smaller’ sites suffer is they don’t get the turnover of bets that the bigger sites do, which means they need to cover their backs more (lower odds) and also pick their spots for when they do attack (higher odds). An interesting comparison would be ComeOn of today and 3 years ago. We obviously don’t have the exact data, but we can tell you from experience that they are in a much better spot pricing wise than they used to be and it’s not even close. Almost exactly the same trends continue as you work down the leagues as well. They have their moments where they are brilliant and at times they are not so brilliant. In fact, the Championship games that we tested showed them to offer the best or equal to best price in 3 out of 10 matches, which is a high strike rate. We realise sample size is small, but these are the facts people! The market coverage is again, right where we would expect it for a site like ComeOn. Premier League games get to enjoy about 100 markets in total, but this number does increase when games turn live as new markets and bets arise because of the score line. As you can see, right in the middle of the table and we would guess probably the average number across all bookies or thereabouts at least. By now you should be starting to see a pattern here with ComeOn, but we will continue. Outside of England the coverage is really good. They are able to offer all major games from across the likes of Spain, Italy, France, Germany, including lower league matches in these leagues as well. In fact, market coverage in these games very much reflect that of the Premier League in terms of which actually puts them ahead of many of the bigger brands. They even include some fairly obscure countries as well. The likes of Ecuador, Finland, Serbia, UAE and Vietnam and are all on offer if that’s your thing. What we will say is that as you get more obscure and remote with your games, the market coverage does drop off quite significantly. You’re certainly not going to find odds on the first goalscorer in a match within the Finish Veikkausliga for example. 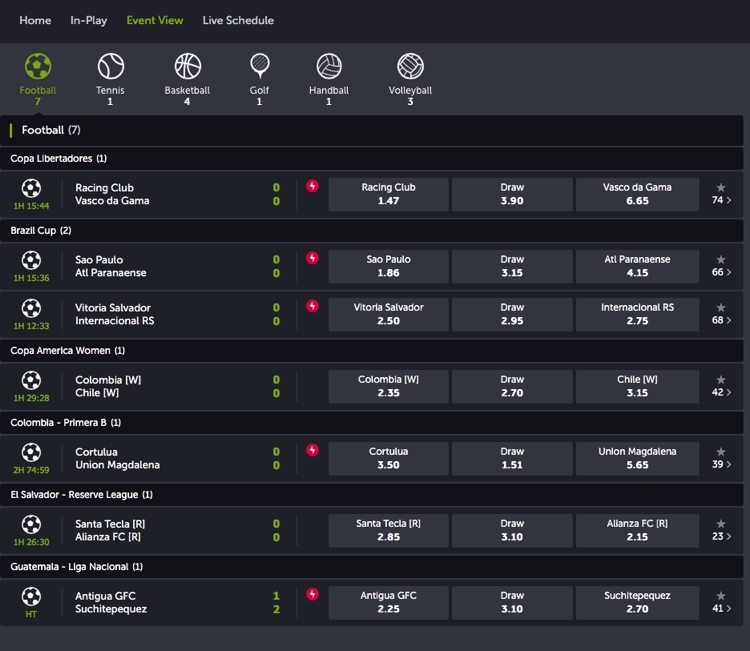 An interesting inclusion onto the site is that of fast markets, which can be accessed via the live betting section. It’s essentially a list of bets and markets that take place over the next 5 minutes within that game. You are able to place a bet on the market and your bet gets settled immediately, without the usual couple of second delay that you get from live betting. It’s fast paced and definitely something that we really enjoyed testing, if only for the speed of the bets. 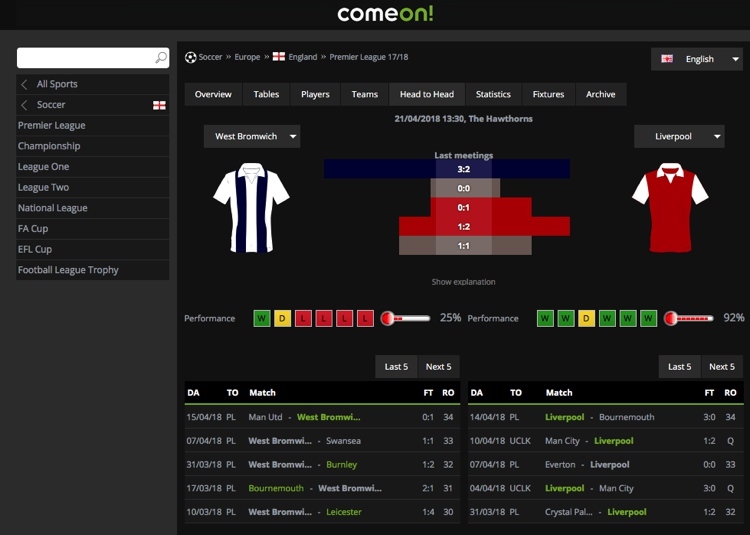 The in-play betting section at ComeOn is probably one of our favourite features of the site. First off, it looks really great. The whole site has undergone a fairly radical facelift in recent years and we can’t even begin to tell you how much better the whole site looks and functions as a result of this. The site allows you to go into another section of ComeOn, away from the main homepage of the site and with a different layout. The layout is really easy to jump between and we liked that it was easily sortable by league and then matches. The ‘favourite’ button is another feature that we liked as when you clicked it, that selection was pinned to the top of the screen. We can’t even begin to tell you how many of these we have seen where the selection doesn’t move it and makes absolutely no difference if clicked or not. The good times continue roll as you click on a match and head into the game with a little more depth. It’s a pretty common looking three tier layout, where you have a list of live games down the left, the betting markets for your chosen match through the middle and a match centre, with stats and bet slip down the right. The match centre is probably the best feature here and it allows you to see where the ball is during the game and what’s going on. It gives you a real sense of what’s happening and is the next best thing to watching the game live in our opinion. The stats that were included were about as comprehensive as we have seen for a single match as well. In total we counted 16 different stats that were on offer, including goal attempts, on target, off target, free kicks, corners, throw ins, yellow/red cards, substitutions and so much more. It’s a really strong addition as it allows you to check the stats on so many betting markets as a result, all of which you can bet live on. Stats are available for most games on the site and the platform is powered by that of Bet Radar, who are one of the best in the game at the minute. You get to see an overview of current form and then previous meetings between the two teams. There’s a little performance rating thermometer to signify form as well, which is a nice addition. As you move down the page then you will get to see the past games in a little more detail. With that included information on the likes of past history between the two clubs, current top goal scorers, information over/under total goals per game and also a worm chart of where they have been in terms of league standing over the course of a season. There is a maximum payout limit of £100,000 per customer per day at ComeOn. This is a blanket payment and whilst a little low for the top end, is actually pretty big for the lesser leagues and even the more exotic bets that they include. It’s worth noting this will reset every 24 hours, but any winning over this amount, regardless of how many bets, will be capped, so bear this in mind if you think this could relevant to you. There’s a good mix of banking options on offer at ComeOn as well, ranging from Credit/Debit cards to that of e-wallets. There will be a fee applied to some of the e-wallet methods, such as Skrill and Paysafecard that both incur a 5% fee when depositing with either. ComeOn has seen huge improvement over the last few years from the last time that we were able to test the site out. As we stated in our opening section of this review, at almost 10 years old, they can’t be classed as the new kids on the block, so they need to be compared with the best, which is what we have tried to do. The bookmaker is really solid, and the recent redesign has definitely added to that. There are still flaws though and the site just doesn’t have the depth in terms of features that other bookies have. ComeOn would be perfect if you are the type of bettor that likes to sit down, find your bet place your bet and then get on with your day. A sort of no fuss, no frills bookmaker, if you will. Our hope is that they continue to strive to improve and not just sit tight maintaining. They’ve a great chance to become one of the best, but whether they take the punt, we’ll just have to wait to find out.